In order for us to overcome low self-esteem, we must know who we are and what we are worth. For this to be accomplished, it is imperative that we understand the work of the cross. God allowed Jesus to die on the cross on our behalf as an exchange for us to have eternal life and an abundant life on earth. (See John 10:10). He allowed Jesus to be wounded for areas where we have fallen short of the mark, and bruised for our premeditated sins. Notice the colon (“:”) in the passage from Isaiah written above. When a colon is inserted in a sentence, it is to signify that the words following it will explain the words preceding it. Following the colon in this passage, it states that the chastisement of our peace was upon Jesus and with his stripes, we are healed. Thus, Jesus took on our sin so that we might have peace and be healed. In other words, he took on our sins so that we might have “shalom” (peace), i.e., safety, health, prosperity and be “raphah” (healed), i.e., made thoroughly whole. God does not want us to lack anything in this life, including a healthy self-esteem. Jesus came to set us free. Receive his gift. Think about it, if Jesus came to set you free and to ensure your health and welfare, why would you ever have to walk with a hung-down head? My pastor, Bishop T.D. Jakes, has said, “The price of a product reflects its worth.” God allowed his only begotten Son, Jesus, to die a horrible death on our behalf. Jesus was mocked, spat upon, and slapped by 500 soldiers. He had a crown of thorns pushed into his head and he received forty stripes with a whip, which ripped his flesh in every lashing. His hands and feet were nailed to the cross, his side was riven, and he poured out every drop of his blood for us. Will you look at the price God has paid for you? This price reflects the great worth God believes you have. We each have great worth in the sight of God. We are the righteousness of God in Christ Jesus. (See Rom. 3:22). Never forget this. Your embracing this is the key to your victory. 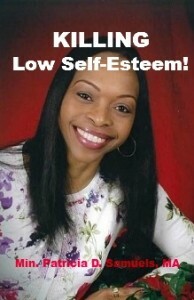 I personally ceased from the troublings of low self-esteem several years ago. While vacationing during my early twenties, I met a lady who by the world’s standards was extremely unattractive. She was so unattractive until I felt very badly for thinking so. She looked as though someone had run into her with a Mack truck and left her for dead. However, before I could feel sorry for her, I noticed that she carried herself as though someone had forgotten to tell her how she looked. “How could she look like this, but act like that?” I wondered. She, indeed, carried herself like a woman of God. She walked in a tremendous peace. Girlfriend also used what she had. She had her hair done in a nice style, which was very popular at the time, and she wore clothes that complimented her figure type. She was no small woman; however, she did not try to force a size 28 into an 8. She found stylish clothes that made her look wonderful. I found this woman intriguing. I could not fathom this peace she had. Suddenly, I found myself wanting to be like her. I wanted to have what she had. I wanted to be able to carry myself as she did, regardless as to whether the crowd accepted me. I vowed right then that I would never think of myself as “less than,” due to flaws in my physical appearance. I figured if this woman could walk around like a queen while looking as if she had been left for dead, then I could accept the things about me that I believed hindered my attractiveness. I began to remind myself how I am fearfully and wonderfully made and how because of Christ, “I got it going on!” You have got it going on, too… Walk in it!